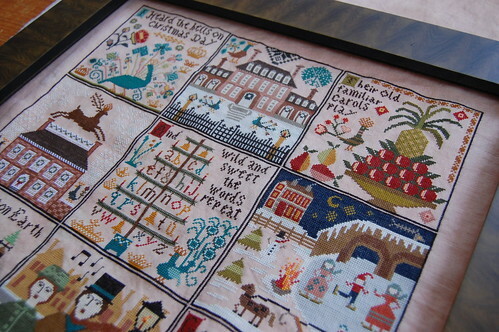 Nicole's Needlework: Christmas at Hawk Run Hollow is Finished!! WOOOO HOOOOO! Yay for you! I'm so proud and impressed! It's gorgeous! Congratulations!!! It's stunning and love the frame!! CONGRATS!!!! Nicole, I bow down before you in utter awe! It's wonderful, Nicole!! But then, I'm sure you feel that way, too. Won't it be fun to have that ready to display for next Christmas?? Congrats on this stupendous finish!! Beautiful finish , well done ! 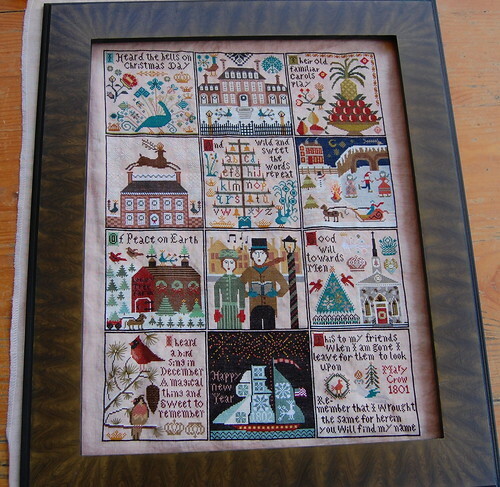 Oh, Nicole, it's absolutely the best...and the Valley House Primitives frame makes it even more special. Love it, love it. So inspiring! your finished WIP is beautiful! You did a fantastic job stitching. I was wondering if you would consider selling or trading your used pattern? Gorgeous!!! Congrats on your beautiful and SPEEDY finish! It looks amazing with the frame. I bet you are anxious to see it in all its glory! Oh, Congraduations! What an amazing finish...it is gorgeous! The frame is just perfect and I can't wait to see it framed! Again, congrats on a fabulous finish! Who Hoo!!! Nicole!!!! Congratulations on an awesome finish! It is just Gorgeous, Nicole! Well done and many congratulations! It is like a box of jewels! Just gorgeous! The Happy New Year square is my favorite. Congrats on a beautiful finish. Can't wait to see what you stitch next. WAHOOOOOOOOOOOOOOOOO!! Congratulations, Nicole! It is STUNNING. I am so psyched for you! Fantastic. It is so beautiful. Love that frame. Congratulations! What a beautiful piece. You go girl!!! Wow, Nicole, congratulations! It's absolutely gorgeous and you stitched it so fast! WOW! That is quite an accomplishment. I am just on my 2nd block--doing 1 a month! I won't have mine done until December. Great job! Congrats again on a lovely accomplishment! bravo il est superbe splendide! Oh well done its gorgeous and you have been so quick too. It's a beauty, a great job! Wow - it looks great! Congratulations on such a big finish! It's so beautiful. Congrats. 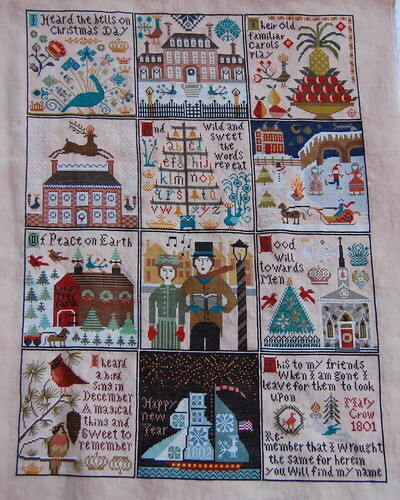 I especially like the square with the reindeer and house. Wow! Congrats on an amazing finish! It's stunning and that frame compliments it perfectly! Love the frame youv'e chosen too. Oh my gosh, that is just gorgeous! You are such a fast stitcher! With a husband and 3 boys I don't know how you do it...maybe your secret is that you don't sleep! Congrats on the finish! I love the frame, too. That design definitely calls for a simple but elegant frame and that is exactly what you chose. Oh my gosh, Nicole, it's stunningly beautiful! Seeing your finish really makes this a must stitch for me, it's so much prettier than the cover photo! Congratulations on such a wonderful finish, and the frame is just perfect for it! Congratulations on your finish! It looks beautiful.. It looks fantastic Nicole. Congratulations! It is gorgeous! 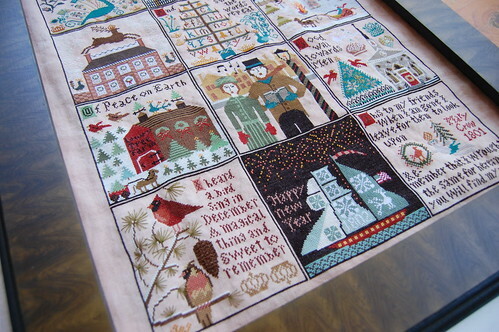 Congrats on the finish...I love to watch your progress on your blog and am so happy that stitchers share their work this way. Now on to Autumn??? Absolutely stunning. Congrats on a great finish. Nicole... simply lovely! you are so inspiring to all of us I must say!!! LOL... can't wait to see your next finish. I have so enjoyed following your progress on this!! Oh, Nicole, you should be so proud of yourself. What an undertaking and what fabulous results. You did a super great job and it looks just wonderful. You ROCK! it is beautiful. my favorite block is the peacock (? ), such wonderful old-world colors, it could hang all year and not be limited to the holiday season. contratulations on the finish! FABULOUS NICOLE! Congratulations on a very fine finish! YAY for YOU! Congratulations on the BIG finish! It looks absolutely gorgeous. What's next? Congratulations! It looks absolutely gorgeous. Oh my gosh this is just breathtaking Nicole!! It is soooooooooooooooooooooo pretty and you got it done!! You must be feeling so elated and happy and it will be even more beautiful in the frame you got for it!!! I am so happy for you and it will be really pretty hanging in your home!! Congratulations on a fabulous finish!!! Oh it's just wonderful! congratulations on this spectacular finish. It is just beautiful and you are so fast! Congrats on finishing, I loved watching your progress on this. Wow wow wow! It's so gorgeous! You do your own framing too? I'm impressed! Seeing your frame I'm thinking I need to use that one too. lol! I know I want the Autumn frame for Autumn! Congratulations on your finish...good for you...that is sure beautiful and I love the Frame too. Congratulations on another great finish!!!! And I love your new tote. Amy does a beautiful job. A huge congratulations Nicole! I think that you got this piece done in record time and your pictures look wonderful. That frame is wonderful too!!! I am so happy that you've finished it! Now, what's up next? Autumn??? Holy cow! It's gorgeous, and the frame suits it perfectly. Congrats on another amazingly quick finish. Happy Dance!!!!! Congratulations!!!! This is gorgeous!!!!!!!! HUGEST of congratulations on your wonderful finish, Nicole! :-) It's so beautiful! I've enjoyed following your progress on this so much and can't believe it only took you 4 months - this will take me YEARS to stitch whenever I get around to starting it, I'm sure! ;-) Great job!! Nicole...it'a absolutely stunning :) You did a beautiful job :) Congratulations! I LOVE that frame!!!! Congrats on a beautiful finish!! It is gorgeous!!! It's stunning, Nicole - you should be justifiably proud of your work. I love the frame you've chosen, too! Everything about it is beautiful! That is so pretty...that has to be a record! Kudos to you on such a great finish. Yeah!!! It's gorgeous, Nicole. I love the frame, too. You must be so thrilled to have this ginormous project completed. YGG! It was so fun watching your progress. Amazing!!!! You are the best stitcher in the U.S.A.!!!! Gorgeous, I am hoping that inspiration hits soon for me on this piece!!! Thank you for sharing! Wow, a big congratulations to you Nicole on a beautiful finish! I would display it all year long. Congratulations. It a beeautiful pices. It is gorgeous!!! Congratulations on a beautiful finish. It's gorgeous, congratulations on the finish! What an accomplishment to get this one finished! 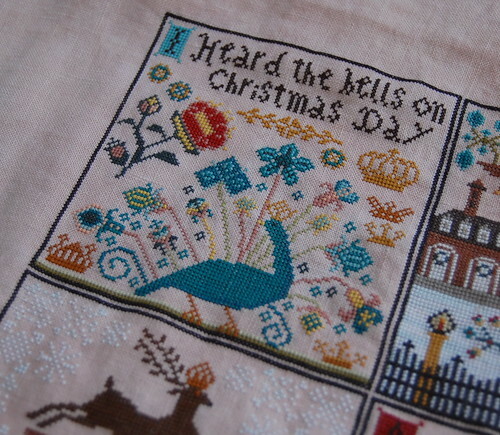 So much work in it and so many hours of stitching. Well done, Nicole!!! It looks wonderful and I like the frame for it too. I am SO disappointed you didn't get it done before Christmas 2009. Really. So, I take it you're already halfway on Autumn at HRH? Awesome job on your finish!! It turned out so beautiful and it is going to look lovely in the frame. it is simply stunning and the frame is just perfect. Congrats! It looks so wonderful. Congrats Nicole! You've done a gorgeous job and it'll be stunning in that frame! OMG!! Congrats on the finish!! It is gorgeous! Well done! Congratulations on the finish! Qu'il est beau ! Quel travail !